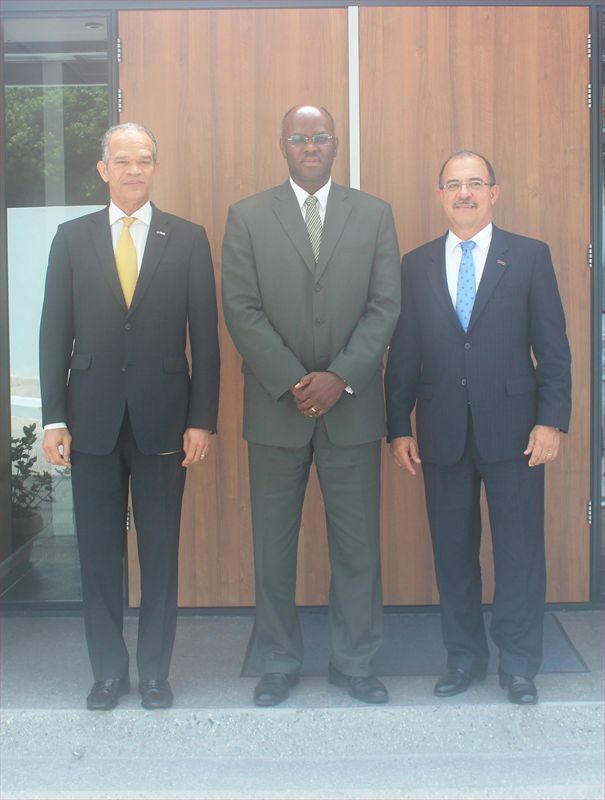 Harbour View – On Monday June 11, 2012, His Excellency Eugene Holiday hosted his colleagues His Excellency Fredis Refunjol of Aruba and His Excellency Frits Goedgedrag of Curacao for the regular Governor tripartite meetings. The Governors meet on a regular basis to discuss and exchange experiences on topics of common interest. The topics they discussed at this tripartite meeting included, the current political situation in Aruba, Curacao and Sint Maarten, financial and economic developments, regional developments and topics relevant at the Kingdom level. The planning for the celebration of “200 years Kingdom”, which is scheduled for 2013 was also discussed. Following the official meeting, Governor Holiday invited his colleagues on a site visit to explore the Simpson Bay lagoon as one of Sint Maarten’s wetlands. During the tour Nature foundation’s manager, Mr. Tadzio Beervoets, provided information to the Governors about the various developments in the Lagoon and about environmental protection initiatives of the Nature Foundation and others.